The main reason for studying this subject came up after having read «Albert Speer: His Battle with Truth» (Sereny, 1995). A friend of Speers who had been in Auschwitz , told Speer about what he had seen and Speer immediately told his friend not to say anything more about it. The book deals not only with Albert Speer himself but it also describes many of the people involved with Hitler during World War II. These people seemed to be normal people with families and developed social lives, but they were in fact doing horrible things and performing abnormal activities. Still, when the allies invaded Europe at the end of the war most of these men (they were mostly men) either lost their lives or were sentenced to prison for many years. Dwight MacDonald stated in 1945 that «now we must fear someone that follows the law more than someone who does not» (Bauman, 1994). After having read Sereny´s book, an idea occurred about doing research on how to change people’s attitudes.1This article is a shortened version. Most of the method section including the results section was not included due to the notion that it was not needed for presentation in PACEM. The purpose of the present empirical study was to see if it was possible to change a participants’ attitudes towards authority or rebelliousness. It was assumed that exposing participants to either authoritarian or rebellious statements would enhance their initial attitudes towards authority or rebelliousness. Furthermore it was assumed that men would conform easier and as a result of this express stronger attitudes towards authority or rebelliousness. Stanley Milgram grew up during the war and went into social psychology. He had worries about the Nazi problem during World War II. He soon realised that it wasn’t the Nazis that worried him; it was ordinary people in everyday life. He took an interest in trying to show obedience as something that was special for the Germans; he also wanted to prove that scientifically the Germans were different. He wanted to prove that they consisted of people ready to obey authority without asking any questions (Milgram, 1974). Milgram set up a laboratory experiment to measure obedience. He first wanted to try it out on people in and then move on to and do the same. He found so much obedience among the Americans that he soon realised that he did not have to take it abroad. A total of 40 men participated in the experiment. Each session of the experiment consisted of a learner, a teacher, and an experimenter. The experimenter was always the same person, a 31-year male dressed in a white lab coat. The teacher was supposed to give electric shocks to the learner, when the learner had given a wrong answer. The experimenter told the teacher that the idea with the experiment was to study the effects of punishment on learning. The experiment really tested how far a participant (the teacher) would go in order to administer electric shocks to another person (the learner), when the experimenter insisted or ordered the teacher to do so. In this test only 35 % of the teachers disobeyed when told by the experimenter to keep on giving electric shocks to the learner. Milgram then decided to change the situation so the teacher could see the learner. Now 37.5 % disobeyed when they were told to continue with the shocks. He then changed the situation again by letting the learner sit close to the teacher. In this different situation 60 % of the teachers disobeyed. The final test meant that the teacher would have to force down the hand of the learner on the electric plate that gave the electric shocks. At this point 70 % of the teachers disobeyed. Milgram also stated that the teachers did not feel that they were acting immoral against the learner. The reason for this was that they saw him as being stupid when he couldn’t give the right answer. All the time the experimenter kept pushing the teacher to keep giving the learner the electrical shocks. When the teacher protested against this and said that he didn’t want to continue, the experimenter told him that it was absolutely necessary that he kept on. There are many reasons why the teacher continued giving the shocks. One was politeness – he wanted to keep his promise to the experimenter, he felt it was embarrassing if he quit too early, the engagement in the task made him forget about the moral judgement and, most important, he made the experimenter responsible for the effects of the shocks. The conclusion in Milgrams experiment was that participants showed a much higher level of obedience than expected. Philip Zimbardo is known for his famous study, the Stanford Prison Experiment in 1971. He used this study to try to understand how ordinary people could become perpetrators of evil such as the transformation of Nazi guards in the Holocaust (Maslach, 1997). He also wanted to focus on the power of roles, rules, symbols, group identity and situational validation of behaviour that generally would repulse ordinary individuals. Zimbardo wanted to find out what happened if, in a group of people, some subjects were made to feel de-individualized and others were made to feel dehumanised in an anonymous environment. In Zimbardos experiment all the participants were randomly assigned into two groups, one group consisting of guards and the other consisting of prisoners. None of the participants knew if they would become a prisoner or guard. The prisoners had to wear a dress with nothing under and a stocking cap, everything to make it as real and humiliating as possible. There were three prisoners in each cell and three guards on every shift. The experiment was originally to last for two weeks but Zimbardo had to end it after only six days (Zimbardo, 1999). Why was that? Since the prisoners were suffering both emotionally and psychologically in the prison the experiment had become unethical. The guards had become harsh, using every possible way they could think of to make the prisoners feel degraded and humiliated. Zimbardo and his staff played their roles so well that they too, forgot that it was only an experiment. The conclusion was that it had worked out too well. Obviously it needed someone from the outside to see how far everything had gone. After the experiment had ended the staff met with the participants a couple of times to discuss their experiences. The prisoners felt that they had lost their identity when being imprisoned and they also felt that everything became too real (Zimbardo, 1971). Although Milgrams study probably contains one of the most interesting and known experiments in social psychology, it has caused a lot of controversy. Milgrams study has been condemned as “dangerous, dehumanising, and unethical research” (Ross, 1988). Today it is ethically unacceptable to perform studies on human obedience similar to those performed by Milgram and Zimbardo. Therefore, the rest of the present study is going to concentrate on whether it is possible to change peoples’ attitudes towards being more authoritarian or rebellious. Many studies also suggest that the more frequently people talk and participate in a group, the more likely they are to be perceived as leaders. Freud believed that groups sometimes engaged in destructive, irrational activities because of their attachment to their group leader. Many of Freud’s ideas about group behaviour arose after he had read work done by Le Bon. Le Bon (quoted in Lippa, 1990) tried to analyse processes leading to mob behaviour. He proposed that people in a crowd acted more violently because they felt anonymous and invulnerable. Newcomb offered another account of group behaviour. He believed that peoples’ attitudes changed as their reference groups changed. The reference groups provide us with guidelines or standards for evaluating our attitudes, our beliefs and ourselves. Zimbardo has also done a lot of research on deindividuation in man. For instance, having your head shaved in the army is one way of lowering your sense of personal identity (Forsyth, 1998). Many studies have been conducted on how to change peoples’ attitudes. People that are exposed to a stimulus for a repeated amount of time will eventually change their attitude toward that subject. This is called the mere exposure effect and it occurs for a broad range of stimuli such as sounds, symbols and people (Zajonc quoted in Lippa, 1990). But if someone is exposed to a stimulus at a very high level it could make that person turn against liking it, i.e. it could have the reverse effect. Festinger (quoted in Kiesler, Collins and Miller, 1969) developed the theory of cognitive dissonance, which is a motivational theory of attitude change. The main proposition of this theory is that when people hold inconsistent beliefs they experience a negative drive state. This is an unpleasant state of motivational arousal that goads someone to act to reduce the drive state. It goads you for example to drink something when you are thirsty to prevent yourself from being thirsty. How is it possible to reduce this dissonance? Festinger suggested two major routes to reduce dissonance, 1) people can change their behaviour, or 2) people can change their beliefs. The dissonance theory (Festinger quoted in Kiesler et al, 1969) gives us a somewhat unsettling prediction stating that if we behave badly toward another person, particularly with little justification, we will then shift our beliefs and attitudes to justify our bad behavior. It also means that we will come to think more badly of our victims. Most people consider themselves to be decent, moral individuals who would never be able to harm another innocent person. If we find ourselves in a situation where we have harmed another person, then dissonance is aroused. If it is impossible to change the harmful behaviour toward that person, the only way to reduce dissonance is to decide that the person was ”bad” and deserved the evil treatment. This is in line with how participants in Milgram´s (1974) experiment justified their actions to give the learners shocks. Participants, who do not behave in a way that they believe in, experience the highest level of dissonance when they believe they have freely chosen this behaviour. This could be explained by considering the statement ”if you are given an order to perform an act you will feel less dissonance when it feels like you had no choice, meaning that you only did what you were told”. Counter – attitudinal behaviour seems to arouse the most dissonance and also leads to the highest level of attitude change among men. This is explained in the way that something which has real life consequences affects people more than something described as an exercise. The forced compliance paradigm refers to the case where a person is induced to behave in a manner that is contrary to his beliefs or attitudes. The induction usually takes place when a person is either promised a reward for taking part or threatened punishment for not taking part. If little pressure is put on a person to perform an act, the degree of dissonance increases. When the behaviour that a person should perform increases in negativity the dissonance increases even more. In each case the theory predicts greater attitude change towards consonance with the act. Research by Schulz – Hardt, Frey, Luthgens & Moscovici (2000) has also shown that people prefer decision supporting information compared to information conflicting with their choice. They had a hypothesis that group composition affects the confirmation bias, and this hypothesis was supported in their study. Assumption 1: After having been exposed to authoritarian statements, participants will express a stronger authoritarian attitude. Assumption 2: After having been exposed to rebellious statements, participants will express a stronger rebellious attitude. Assumption 3: After having been exposed to authoritarian statements, men will express a stronger authoritarian attitude than women. Assumption 4: After having been exposed to rebellious statements, men will express a stronger rebellious attitude than women. In this survey 30 undergraduate students (12 women and 18 men) from the University College of Borås and from the Göteborg University in participated. Participants were randomly assigned to six groups. The mean age of the participants was 25.9 years (Sd=3.8) and fell in the range between 19 and 32. By offering a small reward for taking part in the experiment, it became possible to recruit students to take part in the experiment. The design of the experiment was factorial. A between subject’s factor was whether participants were assigned to control groups, authoritarian experimental groups or rebellious experimental groups. When the participants arrived at the room where the experiment was to take place, they were given general instructions about how to perform in the experiment. The participants were told that they first should fill out a questionnaire asking general questions about authority and morals. After having filled out the questionnaire, they watched the film ”Quiet rage”. After having watched the film, they were requested to answer the second questionnaire asking specific questions about the film. After having filled out this second questionnaire, participants in the experimental groups had to take part in a discussion. Participants in the authoritarian experimental groups were exposed to authoritarian statements. A «mole» was used to express these statements and in this way try to change participants’ point of view towards being more authoritarian. Likewise, in the rebellious experimental groups, participants were exposed to rebellious statements. This time, the «mole» had the aim to try to change the participants’ attitudes towards being more rebellious. Again, the same ”mole” was used. The ”mole” had learned the different authoritarian and rebellious statements in advance in order to be able to manipulate the participants. This was done in order to avoid participants being aware of being manipulated and further to avoid that participants would guess the assumptions in the experiment. During the discussion everything the participants said was recorded. The reason for recording the discussions was to check that the mole had expressed either all the authoritarian or rebellious statements to the participants in the different experimental groups. Participants in the control groups were not exposed to any authoritarian or rebellious statements. All participants were finally requested to fill out the A–R scale. Participants were finally debriefed before they left the experiment. Three questionnaires were distributed to the participants in the experiment. In the first questionnaire the participants had to answer ten general questions about obedience and moral (e.g. To what degree do you feel that one should follow one’s instincts?). Participants were requested to indicate their answer on a scale ranging from 1-7 (not important-very important). In the second questionnaire they were asked to answer ten questions concerning the film ”Quiet rage, The Stanford Prison study”. ”Quiet rage” is a film about a prison experiment where the people responsible for the experiment wanted to study the psychological effects of becoming a prisoner or prison guard (Zimbardo, 1971). The film lasts approximately 50 minutes. The questions asked for opinions about whether the participants felt it was moral or immoral to conduct such an experiment (e.g. What is your impression of the theme in the film?). Participants were again requested to give their answer on a scale ranging from 1-7 (unethical-ethical). The reason for giving these two questionnaires to the participants in all the groups was to check that the control and experimental groups did not differ from each other before the experimental groups were exposed to either authoritarian or rebellious statements. If a difference between the groups were revealed after the first or second questionnaire, this would make it impossible to test the assumptions postulated in the study. During the discussion that followed in the experimental groups after the two first questionnaires, participants were either exposed to 15 authoritarian or 15 rebellious statements, depending upon which group they belonged to. An example of an authoritarian statement was ”Obedience is absolutely necessary for success” whereas a rebellious statement was ”People have every right to do what they want”. Finally the participants had to fill out a Swedish version of the Authoritarian-Rebellion scale questionnaire (henceforth referred to as the A-R scale). The A-R scale was administered to the participants in the experimental groups in order to see whether being exposed to either authoritarian or rebellious statements would have an effect upon the participants. As mentioned before, the assumptions were that participants would change their attitudes toward authority or rebelliousness after having been exposed to authoritarian or rebellious statements. The A-R scale (Kohn, 1972) consists of 15 different statements concerning authority (e.g. Obedience and respect for authority are the most important virtues children should learn), and 15 different statements concerning rebelliousness (e.g. What we need least is an authority to tell us what to do or how to do it). Each statement was to be answered on a scale ranging from 1-6 (disagree strongly-agree strongly). An index measure named “common questions” was constructed out of the mean value of the ten general questions towards obedience and moral. Likewise, a second index measure named “film questions” was constructed by setting up a mean value out of the ten specific questions about the film. Constructing a mean value of the 15 statements in the A-R scale concerning authority also made a third index measure. A fourth index measure concerning statements about rebelliousness was constructed by summing up the 15 statements in the A-R scale concerning rebelliousness. Finally a fifth index measure (A-R scale) was constructed by taking the mean value of the third and fourth index measures. Table 1 gives an overview of the participant’s answers to the different questionnaires used in the experiment. When taking the results into consideration regarding the common questions it was found that the participants’ answers in the rebellious experimental groups were somewhat lower than the answers from the other two groups. Separate one-way ANOVAs (Analyses of Variances) were performed for each of the ten questions measuring the general attitude toward obedience to further investigate whether there existed any differences between the groups. For the question ”Is it your opinion that children owe their parents something”?, a reliable difference was revealed between the control and the rebellious groups. However, a significant difference between the control and the rebellious groups on only one out of ten questions means that there were no significant differences between the groups for all the questions. The results from the analyses regarding common questions indicated that the participants had been randomly assigned to the three conditions in the experiment. Analyses from the answers to the film questions showed a higher mean value in the authoritarian groups than in the other two groups. However, the analyses yielded no significant differences between the different groups for the ten questions that were related to the film. The results from the analyses indicated again that the participants were randomly assigned to the three conditions in the experiment. In the authoritarian part of the A-R scale the analyses revealed that the authoritarian groups showed a significantly higher mean value in their answers than the other two groups. This means that the participants in the authoritatian experimental groups agreed more with the authoritarian statements than the control and rebellious experimental groups. In this way, the assumption that participants after being exposed to authoritarian statements would express a stronger authoritarian attitude received support. When considering the answers concerning the rebellious part of the A-R scale, it was revealed that the participants in the control groups showed a higher mean value than the other two groups. This means that the participants in the rebellious experimental groups disagreed more with the rebellious statements. It must be remembered that the rebellious statements were of such a nature that if you disagree you are more rebellious. This indicated that they became more rebellious after having been exposed to the rebellious statements. The assumption that participants after being exposed to rebellious statements would express a stronger authoritarian attitude thus received support. Finally, when analysing the answers from the total A – R scale again the authoritarian groups showed a higher mean value than the other two groups. Separate one-way ANOVAs were performed for each of the 30 statements in the A-R scale. The dependent variables were the answers to the 30 statements, and the independent variable was the three groups in the experiment. 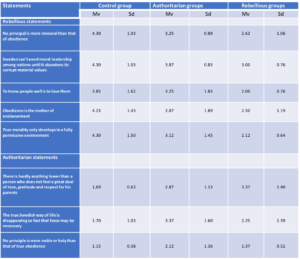 Table 2 reveals the participants’ answers to the five rebellious and the three authoritarian statements in the A-R scale, where a significant difference between the groups was found. For the rest of the statements no significant differences were yielded, and therefore the remaining statements are not included in table 2. For the statement ”No principle is more immoral than that of obedience”, it was found that participants in the rebellious groups expressed the attitude that they thought that obedience was more immoral as compared to participants in the control groups. For the statement ”Sweden can’t exert moral leadership among nations until it abandons its corrupt material values”, a significant difference between the three groups was found, This difference revealed that participants in the rebellious groups expressed the attitude that they thought that Sweden cannot exert moral leadership among nations until it abandons its corrupt material values, at a higher level than participants in the control groups did. For the statement «To know people well is to love them”, it was revealed that participants in the rebellious groups expressed the attitude that they thought that knowing someone well also meant loving that person compared to the control groups. The statement ”Obedience is the mother of enslavement” showed that participants in the rebellious groups as compared to the control groups expressed the attitude that they thought that being obedient would be to confess that people were slaves under an authority. For the statement “True morality only develops in a fully permissive environment”, the participants in the rebellious groups expressed the attitude that they thought that true moral only developed in a fully permissive environment, as compared to the control groups. These results also gave support to the assumption that participants who were exposed to rebellious statements would express a stronger rebellious attitude. For the statement ”There is hardly anything lower than a person who does not feel a great deal of love, gratitude and respect for his parents” participants in the authoritarian groups expressed the attitude that they thought that there was nothing lower than people that did not feel a great deal of love, gratitude and respect for there parents compared to the control groups. For the statement ”The true Swedish way of life is disappearing so fast that force may be necessary to preserve it”, it was revealed that participants in the authoritarian groups expressed the attitude that they thought that force might be necessary to prevent the true Swedish way from disappearing as compared to the control groups. For the statement ”No principle is more noble or holy than that of true obedience”, participants in the authoritarian groups expressed the attitude that they thought that there was nothing more true than that of true obedience compared to the control groups. These results gave support to the assumption that participants who were exposed to authoritarian statements would express a stronger attitude toward authority. Additional analyses revealed that there were no significant main effects of gender or group. This means the results did not give support to the assumption that men will to a greater degree express positive attitudes towards authority than women after having been subjected to authoritarian statements. Furthermore, the assumption that men will be more likely to change their attitudes towards rebelliousness than women after having been subjected to rebellious statements also did not receive any support. The purpose of the study was to see if it was possible to change the participants’ attitudes towards authority or rebelliousness. The first assumption in the study dealt with the belief that if participants were exposed to authoritarian statements they would express more positive attitudes toward authority. The study verified that this was true. It was revealed that participants in the authoritarian groups expressed a strong attitude in that they thought that force might be necessary to prevent the true Swedish way from disappearing, and they also expressed the attitude that they thought that there was nothing more noble or holy than true obedience. This result corroborates with Sereny´s (1995) notion that seemingly normal people were able to perform horrible things and to execute abnormal activities. The participants in the authoritarian groups also believed that there was hardly anything lower than a person who did not feel a great deal of love, gratitude and respect for his parents. This showed that the most important factors that participants in the authoritarian groups felt were that one should obey, that force might be a way of solving problems, and that the most important thing in life should be to act grateful towards your parents. This has also been verified in a study by Van Dijk and Wilke (2000). Van Dijk and Wilke conducted research on the good public dilemma and the resource dilemma, and these dilemmas refer to the similar conflicts between personal and collective interests as in the present study. The second assumption claimed that participants exposed to a rebellious statement would express a more positive attitude toward rebelliousness, and this was also verified. It was revealed that participants in the rebellious groups thought that Sweden cannot exert moral leadership among nations until it abandons its corrupt material values. This would indicate that one first has to take care of one’s own problems before trying to take control over others. It could also be seen that the participants in the rebellious groups expressed the attitude that they thought that being obedient would be to confess that people were slaves under an authority. Thus, participants in the present study revealed very different attitudes as compared to participants in the experiment conducted by Milgram (1974). If one continued to analyse what the participants in the rebellious groups expressed, they thought that knowing someone well also meant loving that person which is interesting, since if you love someone then you also show gratitude towards that person and is careful not to hurt him or her. Furthermore, participants in the rebellious groups expressed the attitude that they thought that true morality only developed in a fully permissive environment and they thought that obedience was immoral. This indicates that people want to be rebellious, but if that is the truth in society today is still to be answered. Other researchers have shown that people may express a stronger attitude towards something after taking part in a discussion. Myers and Lamb (1976) showed that a shift towards a more extreme position took place after a group discussion. This effect is known as the group polarization phenomenon. The third assumption stated that after having been exposed to authoritarian statements, men would express a stronger authoritarian attitude than women. This assumption was not supported in the study. The fourth assumption stated that after having been exposed to rebellious statements, men would express a stronger rebellious attitude than women. Neither this assumption did find support in the study. It is possible that these two assumptions did not receive any support simply because of the small number of participants that took part in the study. Only 20 participants took part in the four different experimental groups. However, it is also possible that the participants in the present study suffered from some form of groupthink rather than changing their attitudes (Janis, 1982). This may also be a plausible explanation of why the assumption that men would express a stronger rebellious attitude than women after having been exposed to rebellious statements did not receive support. We also believe that in every human being lies a hidden wish to act rebelliously against all kinds of authorities. On the other hand, there is also a dark side that wants to act with authority over other people. As Dwight MacDonald stated «now we must fear someone that follows the law more than someone who does not” (Bauman, 1994). The results found in this study are interesting and suggests that further investigations regarding authority and rebelliousness should be carried out, since it is of utmost importance to understand these aspects of human behavior. Bauman, Z. (1994). Auschwitz och det moderna samhället, Göteborg: Daidalos. Forsyth, D.R. (1998). Group Dynamics, California, USA: Wadsworth Publishing Company. Janis, I. L. (1982). Groupthink: psychological studies of policy decisions and fiascos. Boston Massachusetts: Houghton Mifflin. Kohn, P.M. (1972). «The Authoritarianism – Rebellion scale: A balanced F scale with left – wing reversals», Sociometry, 35, 176 – 189. Kiesler, C.A., Collins, B.E., & Miller, N. (1969). Attitude Change. A critical Analysis of Theoretical Approaches, USA: Wileys. Lippa, R.A. (1990). Introduction to Social Psychology, California, USA: Wadsworth Publishing Company. Milgram, S. (1974). Lydnad och auktoritet, Lund: W&W förlag. Ross, L. D. (1988). «The obedience experiments: A case study of controversy», Contemporary Psychology, 33, 101-104. Myers, D. G., & Lamm, H. (1976). «The group polarization phenomenon», Psychological Bulletin,83, 602-627. Schulz-Hardt. S., Frey, D., Lüthgens, C., & Moscovici, S. (2000). «Biased information search in group decision making», Journal of Personality and Social Psychology, Vol 78, (4), 655-669. Van Dijk, E., & Wilke, H. (2000). «Decision – Induced Focusing in Social Dilemmas: Give – Some, Keep – Some, Take – Some and Leave – Some Dilemmas», Journal of Personality and Social Psychology, Vol 78, (1), 92 – 104. Zimbardo, P. (1999). Web Extension to Stanford Prison Experiment. A Simulation Study of the Psychology of Imprisonment conducted at Stanford University. http://www.prisonexp.org. Zimbardo, P. (1971). Quiet rage. The Stanford Prison Experiment. 1. ↑ This article is a shortened version. Most of the method section including the results section was not included due to the notion that it was not needed for presentation in PACEM. Ole Boe (PhD in psychology, Göteborg University, Sweden, 2000) is Associate Professor of leadership at the Norwegian Military Academy. Ulrika Ganning (BSc in psychology) is a graduate student of the University College of Borås in Sweden.